Light: Sticking with it for the duration. Fulfilling your promises and obligations. Bearing up under incredible duress. Dragging yourself across the finish line. Picking yourself up by your own bootstraps. Refusing to quit. Going as far as you can go and being satisfied with your performance. Shadow: Making yourself a martyr. Abandoning your post. Giving up at the first sign of opposition. Being prevented from fulfilling an obligation. Failing to be dependable. Refusing to let something go that needs to be released. Beating a dead horse. Story: The Main Character continues to strive for the goal, despite terrible odds. Relationships. Sometimes relationships of any kind are hard work. You and your partner must be able to count on each other when the going gets rough. If you’ve been unreliable, it’s time to change your ways. If your partner doesn’t seem to be in things for the long haul, you should plan accordingly. Work. When there’s hard work to be done, you learn who your real friends are. Call on others for support, especially if you feel overwhelmed. Take note of who responds. Recognize, too, when you’ve had enough; doggedly pressing on when you’re broken benefits no one. Spirituality. Meaningful progress takes time. You’ll be tempted to give up, to abandon your practices, to shrug off your faith. Stick with it. Your transformation is slow, but steady. Encourage yourself by looking back and seeing how far you’ve come. Personal Growth. Know when to be a hero. Coached by phrases like “When the going gets tough, the tough get going,” you’ll be tempted to crawl ahead even when you’re down. Some causes deserve your total dedication; some don’t. Knowing the difference is an important component of maturity. Fortune Telling. Don’t relax yet; there’s more to come. The test you’re facing now is happening for one reason: to show you who your real friends are. When? December 3rd through 12th. The Battered Hero. The figure on RWS-inspired versions of this card looks exhausted; his Wand is more a prop than a weapon. Still, he persists. If you’ve been through a lot yourself, this card can be a reminder that there’s light at the end of the tunnel. Eight Background Wands. Eight is the number of action and outer work; Wands is the suit of intention. 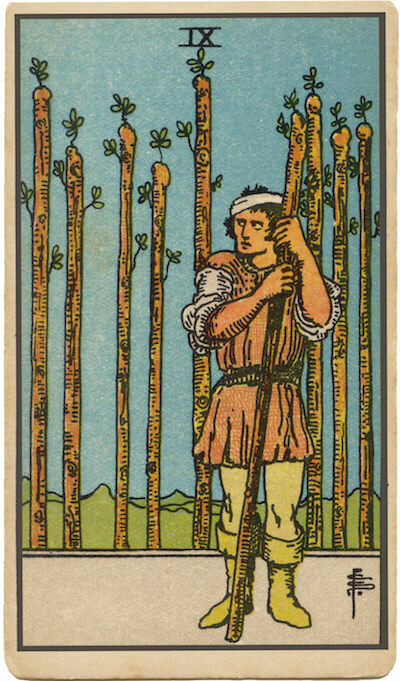 In the background of many RWS versions of this card, we see eight Wands; they represent the work done to get this far. When you’re exhausted, look back. Your achievements can give you the strength to keep moving forward. The Fullness of Intention. A slightly different take on numerology positions this card as the “fullness of intention.” Having done all that can be done, we must let go. The Marseilles Image. Another intrusive Wand appears, but the lattice of eight Wands is to strong to be broken. One imagines the entire structure sagging under the weight of this new addition. Will the work (suggested by the eight Wands) done so far hold up to this new challenge? Only time will tell. How do you cope when things get really tough? When you get low, what encourages you to go on? At what point should you be able to let this situation go?